This is the line of portal tombs I was looking for when I found the other Portal tomb at Malin More. What a fantastic site, simply amazing line of six portal tombs stretching from west to east and 90 metres in length. There is slight evidence at the site suggesting the tombs may have been covered by a single straight sided cairn. I have numbered the tombs from the west, which is the first tomb you encounter. This first tomb, shown above, is an enormous portal tomb with a double capstone. The top capstone has slipped but it is still easy to imagine what an incredible megalithic tomb this once was. The megaliths are situated in two separate fields, equally divided into three in each field. Tomb 2 is a small collapsed tomb about 15 metres east of tomb 1. A further 15 metres east stands tomb 3, which is also collapsed but slightly larger than number 2. To get to the other monuments, all shown below, you need to leave this field and walk east to the next gate. Enter this field and walk back in a westerly direction to see tombs 4 and 5. The fourth monument is a low collapsed tomb in the western corner of the second field. All that remains of tomb 5 is a large capstone resting against a single portal stone. In the eastern corner of this field stands the sixth and final portal tomb, a twin of the first tomb. This tomb alas is also collapsed, but like tomb 1 it had a double capstone. Both of these tombs faced east and would have been fabulous examples of portal tombs in there own right. Keep your eye out in the first field for a large quartzite block located in the field wall. Also look for a standing stone located 100 metres west of the portals just before the first farmhouse on your left. The stone is in alignment with the tombs. The Portal tombs are dated to the late neolithic period around 2,000 BCE. 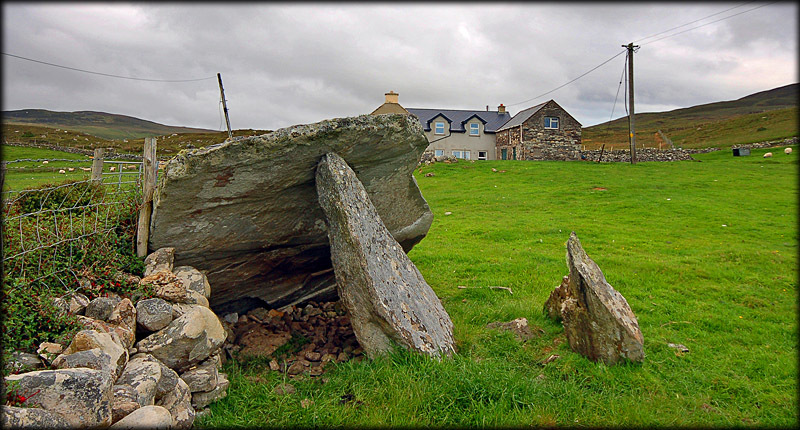 If you are in the Glencolumbkille, Malin More area make you sure have time to visit this standing stone and rather unique line of portal tombs. Situated: From Glencolumbkille take the R263 west to Malin More. After 3 kilometres you will come to Malin More, drive through the crossroads and take the first left up a farm track. The first tombs are located in the field immediately after the abandoned farmhouse. Discovery Map 3: G 4997 8267. Last visit April 2010. Latitude: 54° 41' 23"N. First Portal Tomb.